The rates of cardiovascular disease (CVD) and stroke in Sub-Saharan Africa have surged dramatically in recent decades because of poor diagnosis as well as inadequate treatment and control of high blood pressure (hypertension), which is a key risk factor. Population growth, urbanization, poor diet, physical inactivity, and obesity are exacerbating the problem, and the World Health Organization estimates that CVD will be the cause of nearly 20 percent of all deaths in Africa by the year 2030. Controlling hypertension reduces the risk of CVD by 30 percent and the risk of stroke by 40 percent. But the rates of treatment and control are not equitable across the globe, and Sub-Saharan Africa lags behind resource-rich areas. In Ghana, for example, there were nine nurses and one physician per 10,000 people in 2015 compared to 49 nurses and 19 physicians per 10,000 in the United States. Given the limited availability of physicians, treating hypertension must shift to non-physician care givers. Principal investigator Yvonne Commodore-Mensah, an assistant professor at the Johns Hopkins School of Nursing, and co-principal investigator Fred Stephen Sarfo, who is a neurologist, researcher and educator at the Kwame Nkrumah University of Science & Technology. 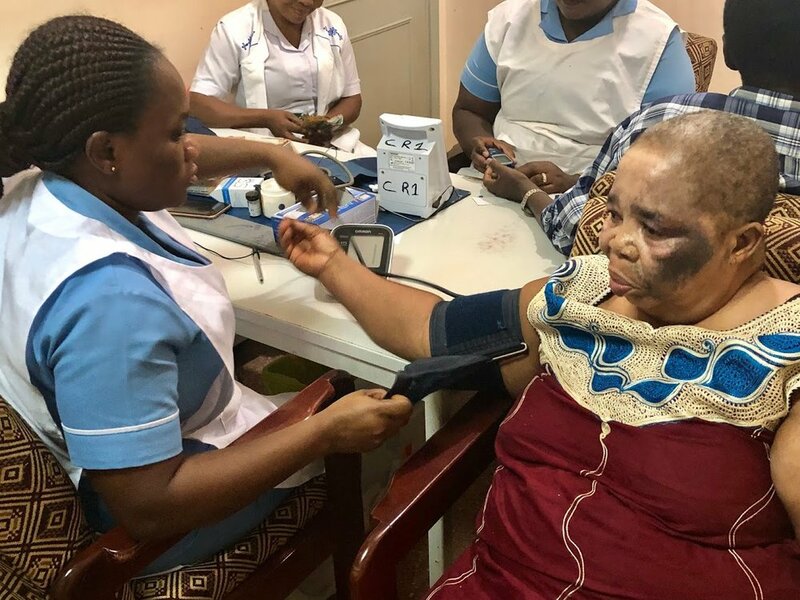 This Alliance project is a pilot randomized controlled trial that will study ways to address the gaps in management and treatment of hypertension in residents of Ghana through a multi-level, nurse-led intervention. Our researchers will seek to translate innovative and evidence-based chronic disease management interventions and mobile health technology to a low-resource setting. We will also study ways to enhance the ability of local healthcare providers and public health workers to apply interventions specifically targeted to this region’s communities, and well as build both infrastructure and the capacity of the local healthcare system to deal with the issue of hypertension. For example, participating patients will receive Bluetooth-enabled blood pressure monitors as well as training from community health nurses on how to use the monitors. Motivational messages designed specifically for the West African notions of the body, responsibility, and wellbeing will also be transmitted to participants through an app, as will reminders regarding medication and appointments. Our Food & Nutrition Security Hypertension Care in Africa team is comprised of researchers and students from three schools at JHU: Nursing, Medicine, and Arts & Sciences. We are proud to work in partnership with Kwame Nkrumah University. We have engaged the support of key academic and clinical partners and the highest levels of institutional leadership in Ghana to develop a care model that is feasible for the region. This project also aims to create a model that is scalable for use across the region for exponential results.